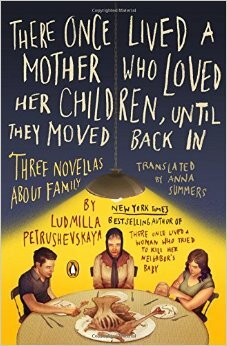 There Once Lived a Mother Who Loved Her Children, Until They Moved Back In by Ludmilla Petrushevskaya is a collection of three translated novellas about the hardship of family life in Russia. Much like the previous book I reviewed by this author, these stories are hard, raw and emotional. Banned for many years, Ludmilla’s work allows her readers to become silent witnesses to the harsh realities of lives behind the Iron Curtain. I really like this author’s style, admire her tenacity, and ability to weave tales that shock and move me every time I read her work. I wish I were able to read the original Russian version as I imagine it must be more powerful than the English translation, which is very well done. I recommend this quick read. It is eye opening. This entry was posted in books, literature, novella, reviews and tagged Books, families, iron curtain, Ludmilla Petrushevskaya, non-fiction, novella, review, Russia, Soviet Union, There Once Lived a Mother Who Loved Her Children, Until They Moved Back In. Bookmark the permalink.